Decorating your home can be a costly process, especially if you don’t know what you want for certain. Home decoration tips can help you plan the layout of your home more cost-effectively and better than just opting for any design that you see. Why Use Home Decoration Tips? Organisation is vital, by using home decoration tips you can save money and time. Make a plan and map out your property, choose the design in which you want for each room and make a list of all of the furniture that you want. If you buy things without any consideration or noting down the price, it becomes extremely easy for you to spend over budget. Which is why you use affordable home decoration tips, so that you can save money on specific aspects of your property development. Which is why we have devised a list of money saving home decor tips, so you can create your dream property for a fraction of the price it would usually cost. So if you want to know how you can upgrade your property for an affordable price, keep reading! Can you remember the last time you had new windows installed or a new front door? It could be time, not only will it improve the exterior of your property but it will also increase the value of your property. Your front door is one of the first things that a person see’s when they enter your home or walk down your driveway. People make quick judgements of a property just by its exterior appearance, to improve the external look of your property we recommend replacing your front door. Dependant on the time your home was built, we recommend choosing a front door that matches the rest of your home’s exterior. As for windows, insulation in your property is so important. During the winter months, if you don’t have adequate insulation, you could fall victim to mould mildew or damp. Be sure that you purchase double-glazed windows to save money on your energy bills and to increase the resale value of your property. If you want to revive your property without spending too much money, this is one of the simplest and most cost-effective ways. 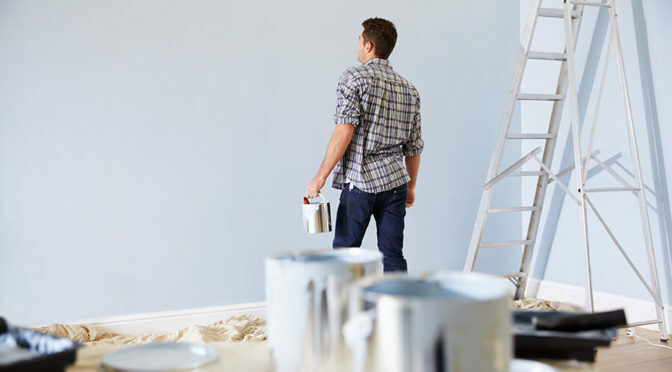 Painting your living room, kitchen or utility room can give it the refreshment it needs and bring a totally new design scheme to your property. If painting isn’t your forte then wallpapering is most likely your best option. The fantastic thing about wallpaper is that it’s available in so many different colours, patterns and design themes. Meaning you can design your home in any way you choose to. You may not of ever considered landscaping to improve your property. But landscaping can add a vast 7-15% onto your homes resale value, dependant on the size of your garden. Landscaping in short basically makes everything neater, tidier and fresh. Meaning you can have crisp green grass, gravel and a designated seating area in your garden all for an affordable price. Just like the outside of your property, guests are very quick to judge when they see an overgrown desolate back garden. Why not scrub up your garden and make it look nice? One of the most sought-after things that homeowners look for in a new home is a spacious garden that is neat and looked after for children or pets. Out of all of the home conversions available to you, loft conversions Watford are most likely the most cost-effective and can provide you with extra living space – without extending outside of your homes natural shell. Loft extensions can be completed in a minimum of 4 weeks, dependant on the size of your property and conversion. As well as this they are at the top of your property out of the way meaning that the construction won’t distract or interrupt your everyday life. A loft conversion can be used for anything from a new bedroom with an en-suite to a recreational games room or extra living room. As well as the added help a loft conversion provides these an also add massive amounts of value onto your home, meaning that even if you spend a lot on your loft conversion, you are guaranteed to see a return in investment. Fed up of your tattered carpet in your living room? Replace it! A new carpet or flooring doesn’t cost a lot and can dramatically revive the overall appearance of your property. Cream carpets can quickly become tattered, stained and collected with dust and grime if not taken care of properly. So why not opt for a grey or beige carpet? Especially if you have young children or pets, who love to walk their muddy feet all over the cream carpet. If your carpet does become stained, we recommend using rug doctor or vanish carpet stain remover to eliminate any tough stains deep in your carpet. One of the most important things to remember when carrying out a task like decorating your home is to know your budget. It becomes easy to overspend when you lose track of furniture you’ve bought, home extensions, labour costs and more. We recommend you create a spreadsheet with all of your incoming payments, as well as your outgoing expenses. And keep strict track of what you are buying for your property. Losing track of your budget is a dangerous game, as you may not be able to end up affording work that you’ve already booked in for – which can become a huge problem. The last thing you want to do is to accidentally get yourself in debt and rock the positioning of your financial security. Start Decorating Your Home Today! Now you know how you can upgrade your home’s decor for an affordable price, it’s time to put them into play. Any of these top tips can help improve the appearance of your home and are the most cost-effective way to do so. For more information about loft extensions Bedford, contact our team today. We hope that this article was helpful, if it was then why not share on social media?